Orkid Malaysia Express is one of the well-known bus operators based in Kluang Bus Terminal. Orkid Malaysia Express offers service for several routes that goes from and towards Johor. With BusOnlineTicket.com, Orkid Malaysia Express offers online booking for bus service from Kluang to Malacca. 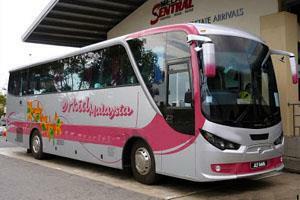 Orkid Malaysia Express fleet is a beautiful single deck coach with 44 seats. The seats are neatly arranged with 4 seats in a row. Furthermore, the coach is also perfectly equipped with air conditioner for a comfortable journey. Moreover, the bus is spacious to accommodate the passengers with ease. So, passengers shall relax and rest in their seats while the bus takes them to their destination. The name Orkid Malaysia Express is famous among locals and travellers that travel from and to Johor. This is due to the quality, professional and trustworthy service that they provide for their passengers. Therefore, passengers can rest assured and trust Orkid Malaysia Express to take them safely to their destination.